I’m not a big sports person, but the onset of fall gets me in the mood for game day-style snacking. There is no actual game watching going on, just the snacking, which is the best part in my opinion. Thankfully, I lucked out and married John who is the exact same. We prefer Netflix over football any day. After discovering a Vegan Mexican Cheese that requires no soaking or cooking, I knew I had to do something special with it. This dip immediately came to mind. Seven layer dips always made an appearance at any sporting event I’ve ever been to, but that doesn’t mean it can’t be made on a random Wednesday when you’re having friends over. Or, if you just make it and then proceed to eat it every day for lunch for an entire week with nothing but chips. 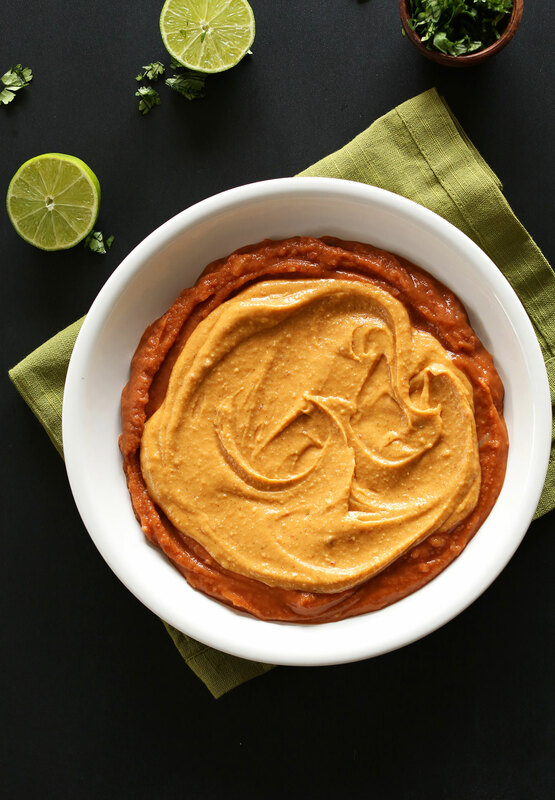 This vegan queso and those refried beans were meant for each other. Hubba, hubba. Wave after wave of flavor it gets better with each bite. I found myself going back for seconds, then thirds, then (What? Who said that?). Make this dip for neighbors, friends, family or just yourself, whether it’s game day or not. You will love the creamy texture, serious cheesiness, fluffy guac and perfect crunch from the veggies. Chips required, obviously. If you do try it, let us know! Take a picture and tag it #minimalistbaker on Instagram. Bonus points if it’s a selfie of a giant bite entering your face. Cheers! 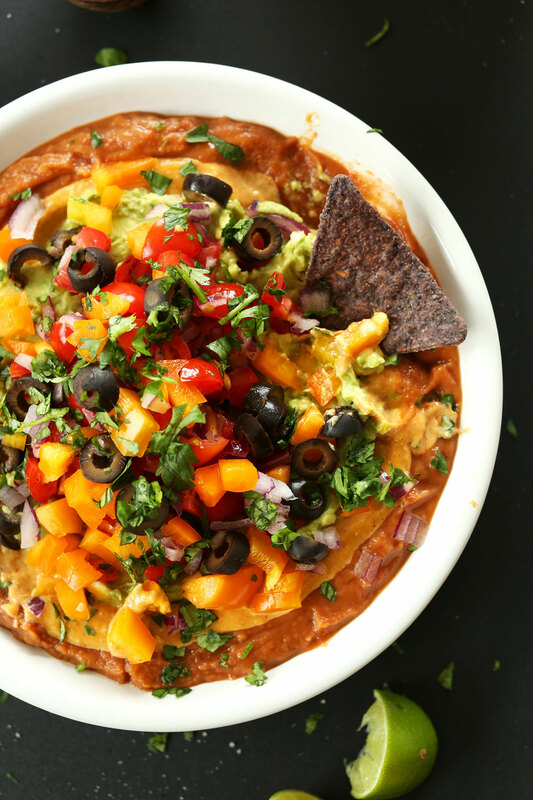 Simple 7-Layer Mexican Dip that's completely vegan! Loaded with protein and fiber, and so flavorful. Perfect for parties, game days, and snacking. To prepare the cheese layer, scoop out 3/4 cup of spreadable Mexican Cheese and whisk in very hot water until it resembles queso - about 1/2 cup (amounts as original recipe is written // adjust if altering batch size). Alternatively, use my Cashew-less Vegan Queso. Next, prepare the guacamole by mashing all ingredients together in a bowl and adjusting seasonings to preference. Do the same with the pico de gallo (or just use your favorite salsa). 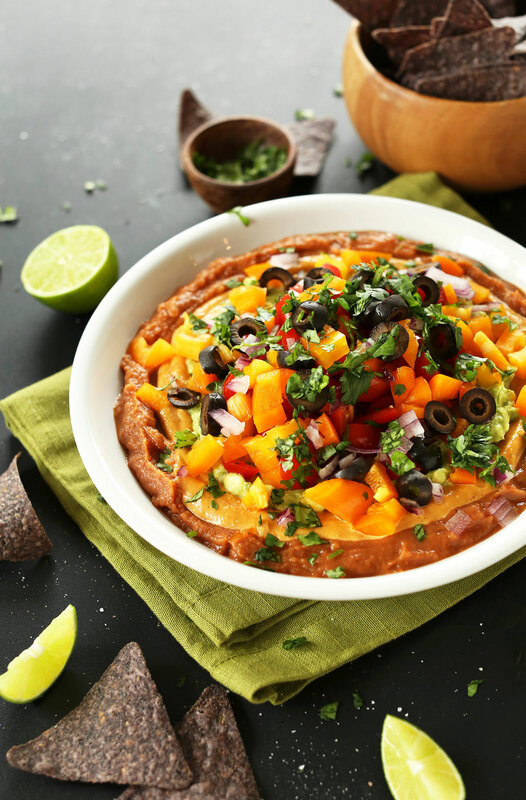 To assemble the dip: Spread out vegetarian refried beans, then top with cheese layer, then guacamole, then pico or salsa, then bell pepper, then black olives, then cilantro. Serve immediately or cover and refrigerate. Can be made up to 1 day in advance. *Inspired by every 7-Layer Mexican Dip ever. Not for the vegan spreadable cashew cheese! This is gorgeous. And the cashew cheese is worth the price of admission!! It was all I could do to keep from eating all of it with a spoon. Headed for an “ignore the super bowl” party and feel well-prepared. Thank you! This dip is simply amazing! I made it for a party with vegans and non-vegans and ALL of the guests loved it. The freshness of the pico de gallo and guacamole on top perfectly compliment the cheesiness of the queso and base of beans. I plan to make this for two more holiday parties that are a couple days apart because both my family and friends need to try this! Key note for the queso, I didn’t get a smooth enough consistency by just adding hot water, so I just threw the sauce in the blender until completely smooth – worked like a charm! Great! Thanks for sharing, Katie! Made this for some non vegan friends. Everyone thought the queso was cheese!! Ha. Gotcha! Great taste and i loved that i could cheat with some already premade stuff. Thank you! I made this heavenly dip for our Nebraska Cornhusker season opener game – IT IS THE BOMB! I can’t wait for my vegan son to come over and help me gobble it up. I may or may not have eaten the rest of the delicious vegan queso by myself – so, so, so, good! You hit it out of the park with this recipe. Thank you so much for sharing! I made this for New Year’s Eve. My brother is dating a woman who follows vegan gluten free eating. I too am gluten free. This was so good – I made the cheese spread for the queso layer as directed, except that we were out of garlic powder so I used garlic salt and reduced the amount of sea salt by half. I used a salsa rather than the chipotle in the cheese spread, and used it again for the dip layer. I used yellow bell pepper for great aesthetics and omitted the olives for personal preference. It was delicious with chips and with raw veggies. I think I’ll try it as the fill for a gluten free wrap for lunch! Thank you so much – my brother’s girlfriend thanked me more than once for making this. My meat-and-potatoes man loved this! My son wants to bring it for lunch to school. A big hit in our protein-loving household. Very easy ~ thanks! Will check out more of your recipes ~ love anything minimalist! Made this and brought it to a potluck where I was the only vegan and it was a hit! :) I made it the night before and it was still just as amazing the next evening. Made this for a group of non-vegans and they cobbled it up in minutes! Love it! I was asked to bring a “bean dip” to a family party. Since I’m vegan, my brother said he thought “beans” were something I would know, ha! So I made this recipe and it was a HUGE hit! Thanks so much for this simple (thankfully) yet amazing recipe! I did heat up the beans and melted the cheese down over that layer. The rest layered chilled on top. Such a nice juxtaposition with warm and cold, the cheesy and the crunchy,…. totally recommend! Eek! The recipe doesn’t say to soak the cashews. I thought it was weird, but followed the recipe as written and ended up having to use a lot of water to smooth it out. Maybe update? I took the dip to a ladies lunch today. It was such a hit. thanks for the great recipes. How long does this keep in refrigerator after making? to share mmy familiarity here with colleagues. Incredible. This Dip Looks amazing Olives are my favourite…My husband will love it for sure. Thanks for sharing Am making this for sure for our next friends get together. Sounds and looks amazing! Where did you find the vegan queso?? Made this for an office party! Told everyone what it was after everyone had a few bites. Everyone LOVED it. Some even went back for 3rds!! 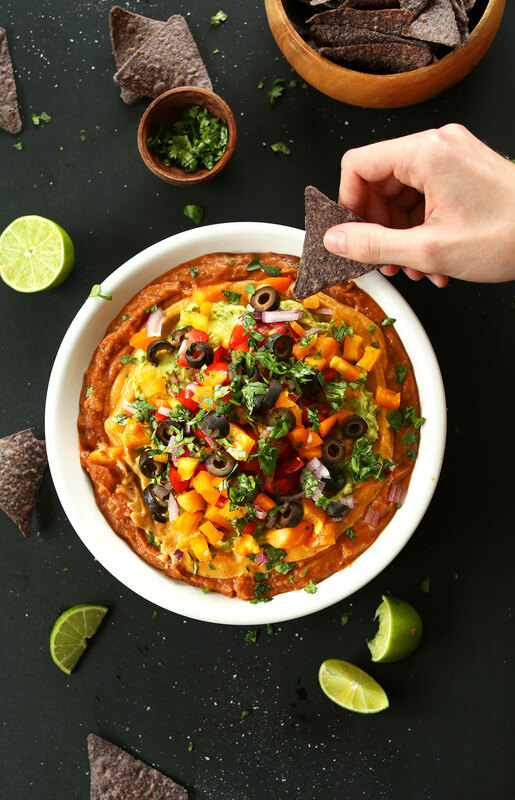 Have made this bean dip twice now, and it’s always a hit! It’s already been requested for my Super Bowl party tomorrow :) Thank you! I made this for a New Years party last night and it was completely devoured. Everyone went on and on about how good it was, and they couldn’t believe it was vegan. I made it with the cashew-less queso and it was so so good. Thank you for such a great dish. Who can turn down a seven layer dip?! This looks amazing! I am always looking for delicious healthy party ideas! This will definitely be an option at our Holiday party, along with the Green Chili Queso! Yum! I LOVED this recipe. Made it for friends and they loved it too! Thanks for such a wholesome, tasty dish! Wonderful! Thanks for sharing, Abigail! I just made this for my son’s birthday party (he turned 42 yesterday). He loved it and I thought it was good too. I told him the chili con queso seemed a bit too hot for me and he said it had no heat to him! It workded out so well as I made regular 7 layer dip for everyone else but he got to have it too with your recipe! Thank you, thank you! Yay! Glad everyone enjoyed it, Timaree! I’ve made this recipe three times for three different groups of people, and all three times I left with an empty container and pleas for the recipe. EVERYBODY loves it!! Yay! I love this one, too!! Just made this for my guests and kinda rudely ate pretty much all of it:D it was great, tanx! I’m sure my friends would of liked it too. 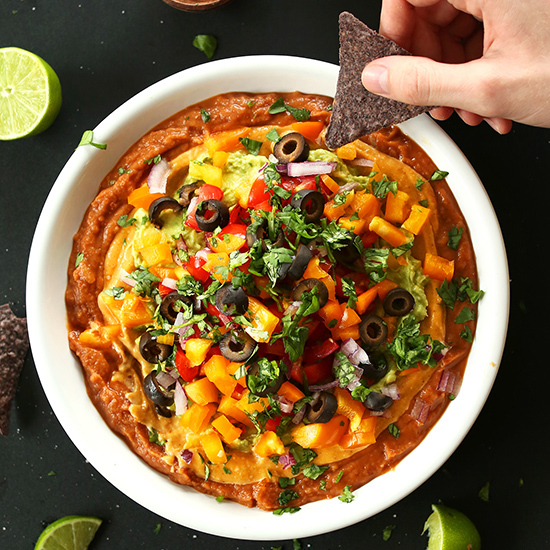 This is a great recipe – however, I think the proportion of queso is too little – the entire recipe of queso would’ve been better (otherwise feels overwhelmed by the beans!). Oh my! This looks amazing. Your photos are so beautiful. What a yummy rendition of 7-layer dip. Thanks! Hello! This looks amazing. Although a bit hard to fetch nutritional yeast flakes here in the UK, unless ordering online. I do want to try it at some point but I’m curious as to what chips you are using? Can’t seem to find any chips that look like that here! Not only does this look colorful and exciting…the flavor is out of this world! Thank you so much for this first of many of your recipes that I will be trying! This was AMAZING!!!! My family just ate it for dinner and they all loved it! I didn’t reveal what the cheese sauce was until we were halfway done. And my hubby kept eating! Haha!! Brought this to a fish fry/Texans game party. My co-workers ate it within 10 minutes! No one knew it was vegan!! You are awesome Dana! Ha ha Dana, I love it! “Game-day style snacking”. Amen to that. That’s something related to sports watching that I can get on board with! Love your recipes. Can’t wait to try this! Thanks Felicity! Hope you love it! Oh my! That looks heavenly! I can’t wait to try it. I’ve been on such a Mexican kick lately. Not to mention the ingredients! So much health in one dish! This looks gorgeous. You two have the right idea—enjoy treats that are like those enjoyed by football fanatics without having to watch a bunch of overpaid big guys with not-that-high-IQs (there! I said it!) tackle each other…and much healthier, homemade treats as well. This and some Buffalo cauliflower “wings” and we can have our own SuperBowl party! That looks like 7 layers of dip heaven! You have turned me into a vegan cashew cheese believer with this delicious seven layer dip recipe. Not that I’ve ever been anti-vegan by any means however the commercial vegan cheeses I have tried thus far have left much to be desired. My husband, a huge dairy fan, also loved it and I had to convince him this recipe contained no cheese as your cashew cheese alternative was that good!! Thank you for giving us healthier non-dairy options to try! Yay! That’s amazing news – husband-approved and impressed! I am so with you…totally not a sports fan…but love the great snacks! This looks and sounds delicious and so much less guilty than traditional 7 layer dip. Pinning to make soon! Loving this soooo much!! 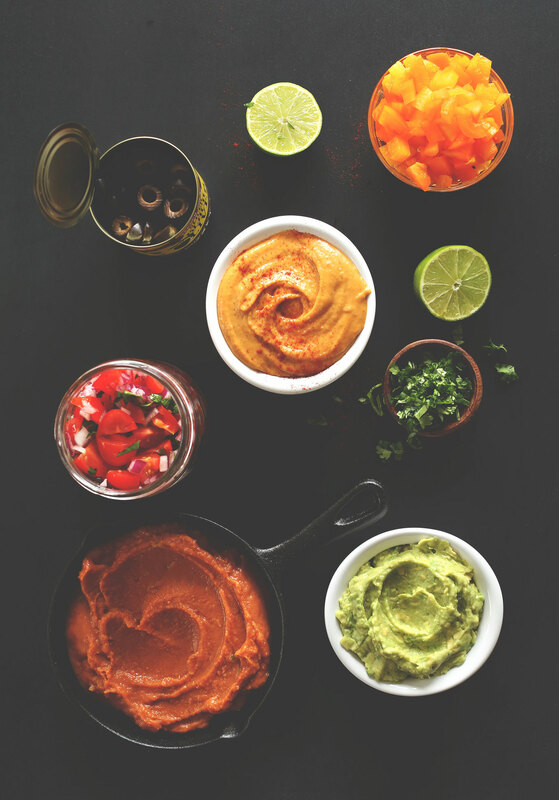 There’s something so comforting about Mexican dip…I’m all over it! This looks amazing! I’ll take Netflix over football too. However, I think I’ll take this amazing looking dip over Netflixs too. I think it will require my full concentration. Absolutely love it. Stunning pictures! I’m with Medha — there’s some kind of hunger multiplication factor with each layer that went on! this looks delicious; a refreshing take on the often overly goopy seven layer dip. hooray! I don’t think 7-layer dip should be saved for football games, I always think of it as a NYE food! This looks like the perfect thing to eat while I pretend to watch the game :-). Now this is seriously a delicious dip! Definitely could devour a bowlful with some corn chips right now.. love it! oh my god, this looks so unbelievably good!! This looks like it would warm you right up! I totally agree with you I feel like the snacks are the best part. This is such a pretty dish! The colors are gorgeous. I love football, but since having kids, rarely watch a whole game. That won’t stop me from making game day snacks though! It looks so colorful and creamy, I want to just take the whole bowl and eat it with a spoon! And I agree with you; I like keeping the game day snacks, but dumping the game.